Wondering why there wasn’t as much Dwayne Johnson in Fast & Furious 7 as the past couple of films? That’s because his schedule clashed with the filming of San Andreas, hence why he’s hospital-ridden for most of it. But was it worth it? That depends; do you want to see a disaster movie that’s near identical to every single disaster movie ever made, with little to no new elements thrown in and a heavy reliance on effects that make it all look as convincing as a giraffe pretending to be a raccoon? Hopefully, you answered “no”. San Andreas – or, as we like to call it, The Day After Independence Day on the Deep Towering Poseidon Impact During Armageddon in 2012 – is an amalgamation of every single cliché, every single stock character, and every single plot point to have ever featured in a disaster movie of the past few decades. Forced patriotism? Check. The good-looking hero with family issues? Check. Characters exclaiming “Oh my God” to everything happening around them to a point where it should be its own drinking game? Present and correct. If that’s what you’re looking for in a film like this, then that’s fine; but for the rest of us, it’s an incredibly dull and predictable experience. You can pinpoint exactly what’s going to happen minutes before the characters experience it themselves, from the pretty heavy foreshadowing – an opening lecture on earthquakes given by Paul Giamatti’s doughy scientist for one, which is amazingly coincidental given the following events – to the set-ups with all the subtlety as a punch in the face. For instance, the moment you know that Ioan Gruffudd’s architect/”douchebag stepfather” cut-out has a construction site for his latest skyscraper, it’s highly obvious what’s going to happen to it by film’s end; in fact, you’re counting down the minutes until it happens, and tend to be far more focused on that than anything else going on in this movie. Given that this was made in 3D, you have to hand it to director Brad Peyton – whose previous collaboration with Johnson came in the CG-heavy family sequel Journey 2: The Mysterious Island – that some of the set-pieces are well staged by him in this format, including a fairly impressive one-shot sequence set in the interior of a collapsing building. However, it’s tarnished by the fact that the effects work, while grandiose and epic to a certain degree, is suitably less than standard. You can clearly tell what’s real and what’s fake, with endless CG buildings tumbling down that look like scenes straight out of Transformers or Man of Steel, and some rather dodgy green-screen for a multi-million dollar blockbuster. Tension is non-existent because it simply isn’t there, compared to something like Mad Max: Fury Road when you can confidently spot the practical effect over the computer graphics. It’s just an endless spectacle of CGI backdrops being decimated, and to add insult to injury it’s not even great CGI. Another worrying angle this film seems to take is in how it reassures its masculinity – all the men in this movie, not least Johnson’s hunky helicopter rescue pilot (who to his credit tries to make his thin-veiled character work to the best of his ability), are made out to be the unquestionable heroes, even Giamatti who doesn’t do much to save people is still declared a national hero by the end. The women, on the other hand – bar perhaps Alexandra Daddario as the fairly competent and unrealistically attractive daughter of Johnson’s character – are either completely useless or idiotic screaming machines that need to be rescued at every available opportunity. The film even opens with a woman nearly plummeting to her death while driving because of her own stupid actions – though to be fair, the attempted rescue mission that Johnson and his team pull off is in and of itself an appalling exercise in getting everything about helicopter rescue missions wrong – which sets the bar for women pretty low and is sadly never lifted much higher. 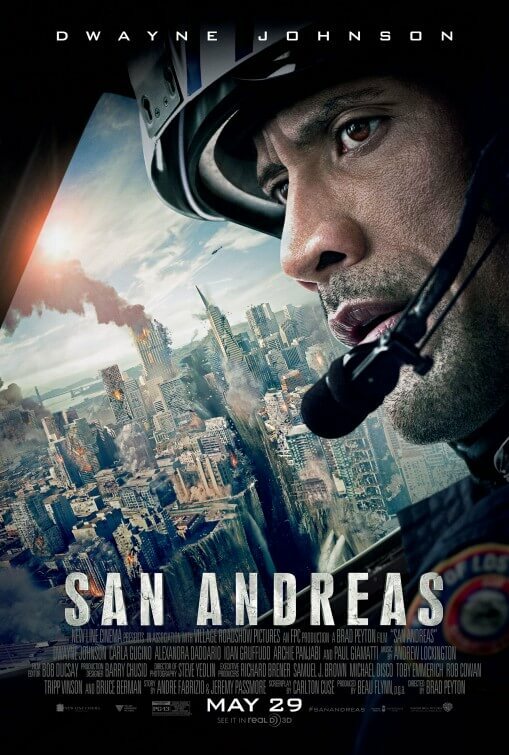 When all is said and done (and decimated), San Andreas as formulaic as disaster movies can get, and in an age where people are starting to make more of an effort with their big-budget blockbusters this is an alarming step backwards in both quality and quantity. San Andreas uses every single disaster movie cliché in the book and proceeds to do nothing new with any of them, with some dodgy and obnoxiously fake CG work and less than respectable female caricatures not helping the film’s overall dull and formulaic sense of self-worth.